Organizations today collect a tremendous amount of data and are bolstering their analytics capabilities to generate new, data-driven insights from this expanding resource. To make the most of growing data volumes, they need to provide rapid access to data across the enterprise. At the same time, they need efficient and workable ways to store and manage data over the long term. 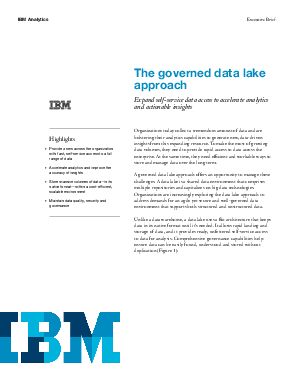 A governed data lake approach offers an opportunity to manage these challenges. Download this white paper to find out more.